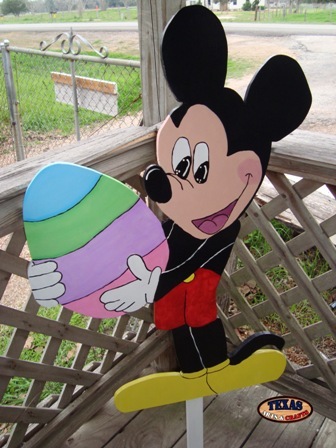 The Disney Easter sign Mickey Holding Easter Egg is cut out in our workshop. Mickey is hand painted black with red shorts and yellow shoes. He is holding a multicolored Easter egg. The dimensions are approximately 32.50 inches tall by 23.50 inches wide by 2 inches deep. The yard sign has a 27 inch stake. The sign weighs approximately 8 pounds with packaging. For the continental U.S. shipping and handling is included in the listed price. For shipping outside the continental U.S. please contact us through our Contact Us page. 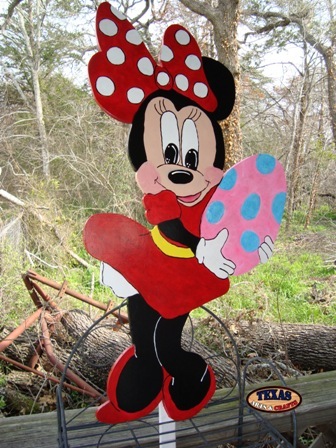 The Disney Easter sign Minnie Holding Easter Egg is cut out in our workshop. Minnie Mouse is hand painted black with a red dress and red shoes. She has a red and white polka dotted bow. She is holding a multicolored Easter Egg. The dimensions are approximately 40 inches tall by 22 inches wide by 2 inches deep. The Easter yard sign has a 34 inch stake. The sign weighs approximately 9 pounds with packaging. For the continental U.S. shipping and handling is included in the listed price. For shipping outside the continental U.S. please contact us through our Contact Us page. The Disney Easter sign Pooh With Egg Basket is cut out in our workshop. Winnie the Pooh is hand painted yellow with a red shirt. 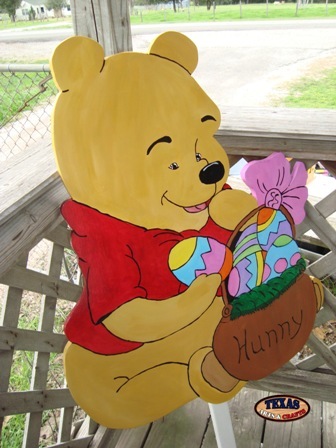 Pooh is holding a Easter Basket with multicolored eggs. The dimensions are approximately 29.50 inches tall by 23 inches wide by 2 inches deep. The sign weighs approximately 9 pounds with packaging. For the continental U.S. shipping and handling is included in the listed price. For shipping outside the continental U.S. please contact us through our Contact Us page. 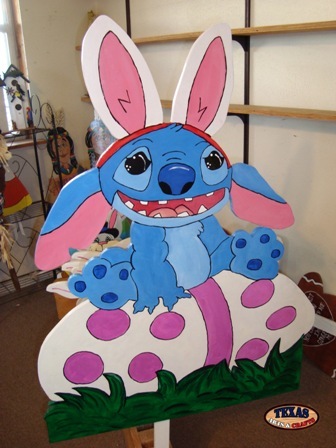 The Disney Easter sign Stitch On Egg is cut out in our workshop. Stitch is hand painted blue with pink and white bunny ears. He is sitting on top of a pink and white Easter egg. The dimensions are approximately 36 inches tall by 27.50 inches wide by 2 inches deep. The sign weighs approximately 11 pounds with packaging. For the continental U.S. shipping and handling is included in the listed price. For shipping outside the continental U.S. please contact us through our Contact Us page.